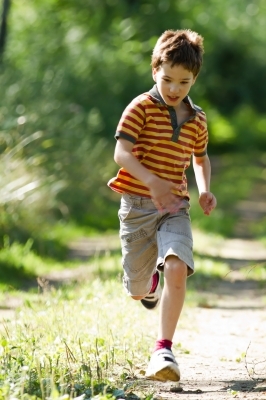 We are constantly being told that our children need to more active and that childhood obesity is on the rise. Therefore it is understandable that parents are keen for their children to be as active as possible. Just as adults have musculoskeletal problems or pain so do children. Generally the sports injuries that adults suffer from can be present in children, however there are some problems that are specific to children. One of the most common problems that we see which are confined to children in our clinic in Eskbank near Edinburgh; are those that come under the heading of traction apophysitis, which are more commonly referred to as “growing pains”. These commonly can affect the knee, ankle, hip and less commonly(at least in Scotland) the elbow and shoulder. Just as with adults one of the most important things to bear in mind when children present with joint or muscle pain is to rule out more serious problems. Therefore the first thing that your physio will want to do, is to rule out any more serious or sinister pathology. This will done in the course of the initial assessment and then subsequent treatment sessions. What is a Traction Apophysitis? To understand what a traction apophysitis is we first need to discuss how childrens’ bones grow and develop. An apophysis is a cartilaginous prominance that is next to the growth plate. It is the point where the tendon attaches before the skeleton matures. The growth plate is one of the points where new bone is laid down when the bones are growing, once the skeleton reaches maturity the growth plate disappears. Use or overuse can result in a traction apophysitis where repeated excessive load pulls on the tendon insertion causing partial avulsions of the apophsitis and inflammation. If this force is extreme for example a forceful push off when sprinting or landing, then it could result in a avulsion fracture where the tendon insertion is actually pulled off the bone. This would result in sudden onset of pain and disability. If this is suspected then the most appropriate action would be to present to A&E at the Royal Hospital for Sick Children in Edinburgh. Why does a Traction Apophysitis occur? During growth spurts or periods of rapid growth the growth of long bones such as the thigh and shin; exceed the ability of the surrounding muscles and the tendons which attach them to the bones, to lengthen sufficiently. Therefore there is excessive load or tension on the attachment site or apophysis, This is an extremely common contributing factor and the majority of the patients presenting to our clinic have normally had had a growth spurt and corresponding lack of flexibility. Training load and competition obviously increase the load on the muscle and tendon and therefore the load on the attachment site. The majority of those presenting to our clinic are presenting because they are unable to train and compete or are having problems doing so. Poor technique, if there is a particular sporting or other activity that the child performs repeatedly it is important to ensure that they carry it out with good technique in order to reduce the load to the minimium level possible. Biomechanical factors such as over pronation. Similar to the point above regarding technique it is important to ensure that the childs biomechanics are as optimal as possible, in order to reduce loading to the lowest level possible. What do children with a Traction Apophysitis complain of? Generally a traction apophysitis is a result of repetitve loading and therefore the child will generally complain of a gradual onset of pain for no apparent reason. Although sometimes the patient will present with worsening symptoms after one off trauma. At our clinic the most common areas affected are the knee and heel. This is probably because locally football, rugby, hockey and athletics are popular. These are sports where running interspersed with sprinting predominate. In the USA and Canada Little League Shoulder and Little League Elbow are extremely common, this is because baseball is far more popular with children spending long periods of time pitching, throwing and swinging the bat. Taking the knee first, a traction apophysitis can occur at the tibial tuberosity whch is the bony lump just below the kneecap, where the patellar tendon attaches to the tibia. It is often referred to as Osgood-Schlatter’s disease. As mentioned above this often occurs during or after periods of growth; questioning parents often reveals that new clothes or shoes have been needed. There is normally pain and sometimes swelling over the tibial tuberosity and the pain is normally exacerbated by jumping, running or kneeling. At the knee a traction apophysis can also occur at the bottom of the kneecap where it is called Sinding-Larsen-Johansson disease. The symptoms are similar to Osgood Schlatter’s disease only located at the bottom of the kneecap instead of at the tibial tuberosity. The other common area that is affected is the heel, where it is referred to as Sever’s disease, It is considered to be the most common overuse injury in children accounting for around 8% of all overuse injuries in this age group. It’s symptoms are similar to Osgood Slatter’s disease only at the back of the heel. Its normally worse first thing in the morning and during and after running and jumping. So if your child has a Traction Apophysitis what should you do? As with adults with tendinopathies we would suggest seeking advice and treatment sooner rather than later. The reason being that the sooner we can assess and treat your child, the sooner we can start addressing the causes and minimise the disruption to their training and sporting activity. First of all your physiotherapist would take a detailed subjective history regarding their training and any recent changes to their training. Then a thorough objective assessment would be carried out, measuring muscle length, palpating to find the site of the traction apophysitis and identifying any biomechanical issues that need to be addressed. A treatment plan would then be drawn up in consultation with you and your child, with the aim of returning he or she to their chosen activiity as quickly as possible. Your physio would also discuss with you both, strategies to prevent reoccurrence. Therefore if your child is having problems please contact us. We’re based in Eskbank near Edinburgh, we are open from 8 am until 8 pm Monday to Thursday and 8 am until 6 pm on Friday. We normally have appointments available within a few days and will sometimes have same day appointments available. We have reduced rates for children under 16 years of age and those who are members of local football, rugby, hockey and other sports teams. This entry was posted in Conditions we treat and tagged Ankle injuries, Football, Knee injuries, Rugby, Sports Injuries. Bookmark the permalink.